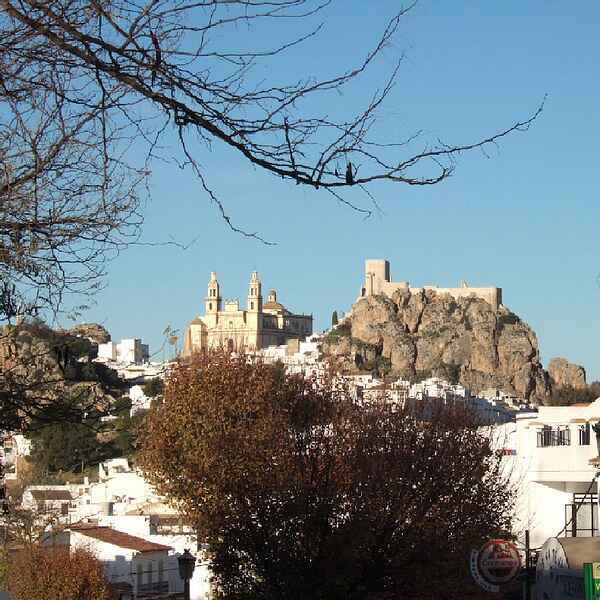 Situated in Olvera, one of the White Villages; a perfect base to explore the mountains of the Sierras de Cadiz, with walking, cycling, horse riding & bird-watching on the doorstep. Delightful, newly renovated townhouse situated beneath the church in old Olvera. Comfy lounge on the ground floor with fully equipped & fitted kitchen incl. washing machine, fridge & cooker, DVD & CD player/radio. Sofa-bed, chair & breakfast-bar with seating in lounge. Well stocked bookshelf for readers, plus large selection of CDs, DVDs & audio books. There is a full picnic set for days out. Lovely wrought iron staircase up to 1st floor bedroom which has a double bed, storage (wardrobe & chests of drawers) & en-suite shower room. All bed linen, towels, & beach towels are included along with hairdrier. Door from bedroom out onto small terrace with table & chairs, perfect for that early morning cuppa! From here, you have another spiral staircase up onto the large roof terrace, complete with table & chairs, loungers, wine fridge & shower with stunning views of the surrounding area. The ideal spot for catching the sun, or sampling the local wines! There is heating for the cooler winter evenings & a fan for the long hot summers! Car hire at the airport is cheap, but pick-ups can be arranged if preferred, as well as welcome packs if required. Someone will be there to meet you on arrival at the house (English, Dutch & Spanish spoken) & to help with any queries. There are lots of bars & restaurants in Olvera, as well as a Municipal Pool in summer (June-Sept.) & swimming at Lake Zahara 20 mins away, with its stunning surroundings & man-made beach. Also worth a visit is Ronda (approx. 40 mins) for shopping & sightseeing at the fantastic gorge. A little further & wel worth visiting are Cordoba, Seville, Cadiz & Jerez. Olvera is approx. 70 mins from Jerez airport, 90 mins from Malaga or Seville all served by low-cost airlines. Also can easily be reached by bus from Ronda, Seville, Jerez etc. We are supported by a friendly, multi-lingual management team who live in Olvera & will be able to assist you if necessary during your stay. English/Spanish/Dutch speaking representatives in town to welcome you & be of assistance.